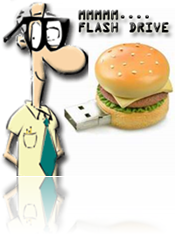 Do you have a flash drive that is a little bit iffy? Are you just a geek and like to run checks against”¦ well anything that you can run tests against? 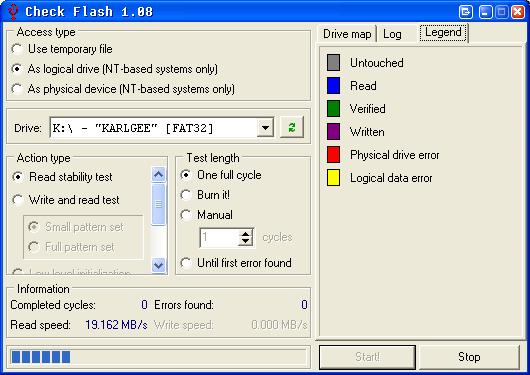 Are you worried that your flash drive might be failing? If you have answered yes to any (or all) of these three questions than have i got a free application for you! I have been using it for a little while now and I must say it does exactly what it says it will do. 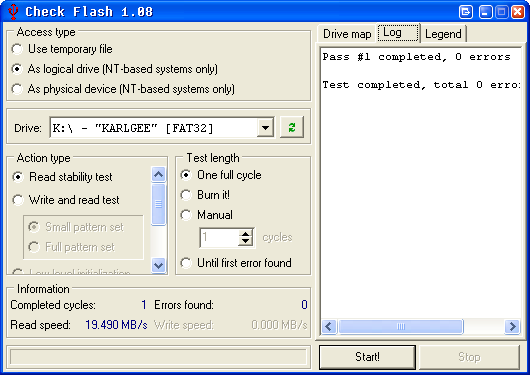 It will check your Flash Drive for bad blocks or in errors in reading and writing to it. Think of it as putting your Flash Drive through the test, and it does work for normal, regular other drives as well. SSD drives are still pretty damn expensive and you do not want to start using a damaged drive then you can use this to test those drives also. The homepage for this little app is in Russian and is located at http://mikelab.kiev.ua a direct download link is available to our non-Russian speaking friends here http://mikelab.kiev.ua/PROGRAMS/ChkFlsh.zip of course you could always just translate the page using any number of web translation tools but hey we are trying to make it easy for you right? Let’s see what ChkFlsh can do! 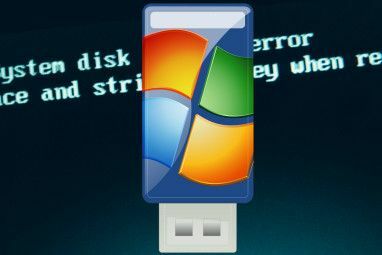 Long story short this application has the ability to read and write to every block or sector of your flash drive. Why would you want to do this? Well it simulates actual read and write activities to your drive, and that will tell you if your drive might be getting ready to fail. After you download and ChkFlsh you will have three files, one executable, one text file and one .bat file (Called Danger.bat). 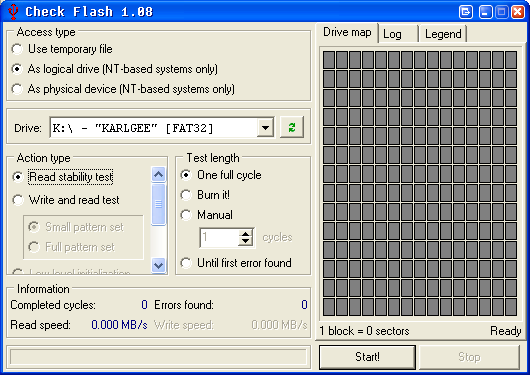 The danger.bat file will execute ChkFlsh with the /ALL option and launch ChkFlsh’s GUI as you can see below. 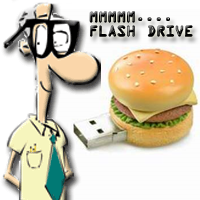 If you run just ChkFlsh.exe you will only see flash drives. 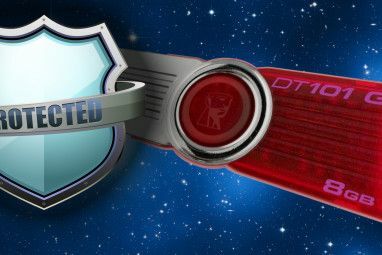 This full test will destroy the data on your drive hence the files name DANGER! I choose the second option to use as a logical drive and selected K:\ my 2gb Cruzer. Unless you want to blow away all the data on your drive you should only use the Read stability test. AGAIN THE WRITE AND READ TEST WILL WIPE YOUR DRIVE! YOU WILL HAVE TO FORMAT IT TO USE IT AGAIN! BEWARE! So as it reads through your data it will assign each block a color so you can see what is going on. Errors and read speed can be found at the bottom of the applications window. And if you click on over to the Log tab you will see your results in plain English. found, error message displayed and no any process started. 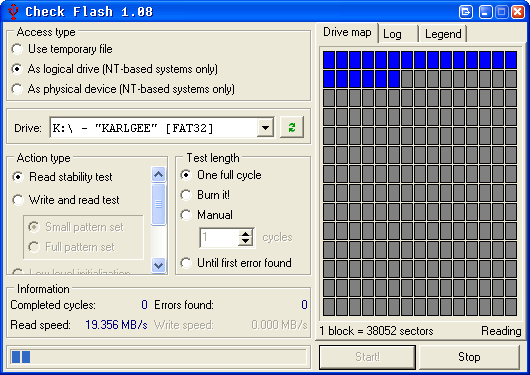 Do you have another method to testing Flash drives? Do you put your SSD to the test? Let us know in the comments! Oops, I ran thumb drive through washer and dryer. Wanted to see if flash was okay. Checked okay. I know drive may fail in future due to corrosion. Single screen interface makes software easy to use. Only used: Use temporary file, Write and read test, One full pass. 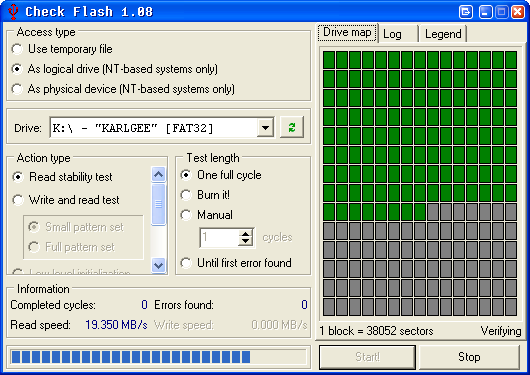 Does an alternative exist for testing flash memory on Android device ? I made 3 scans on read only mode and found 0 errors, then I made a "write and read" scan and it found 48 errors, is it fake? 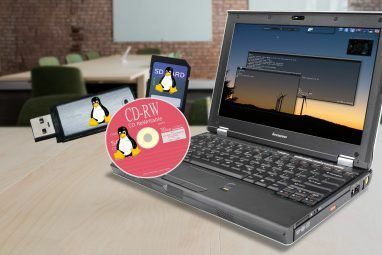 Have you ever looked at the program from Computer und Technik? see: ftp://ftp.heise.de/pub/ct/ctsi/h2testw_1.4.zip. read the explanation on: http://www.heise.de/ct/c-t-Systeminfo-473388.html and look for h2testw. I have a problem with my flash memory. After inserting it, and when I want to open it, I found this message "Please insert a disk into removable disk..". Would you please help me to solve this problem? Is this an adapter, hub, converter or a flash drive? Can you be a little more specific?